The Terrorsurfs official music video for "Dust Off My Boots"
The Terrorsurfs and Sharawaji Records are proud to announce the official music video for "Ape Cape" as featured on The Terrorsurfs new LP "Zomboid Surf Attack". The full length album including the hits "Surf Bomb / Loco Dinosaurio" is available from Sharawaji Records as a digital download and digipack CD. On Friday the 9th of December, The Terrorsurfs are live at The Crew, Nuneaton as special guests of the mighty S PUNK 7. You can buy the album and other merchandise directly from the band, or from www.terrorsurfs.com or www.sharawaji.com . 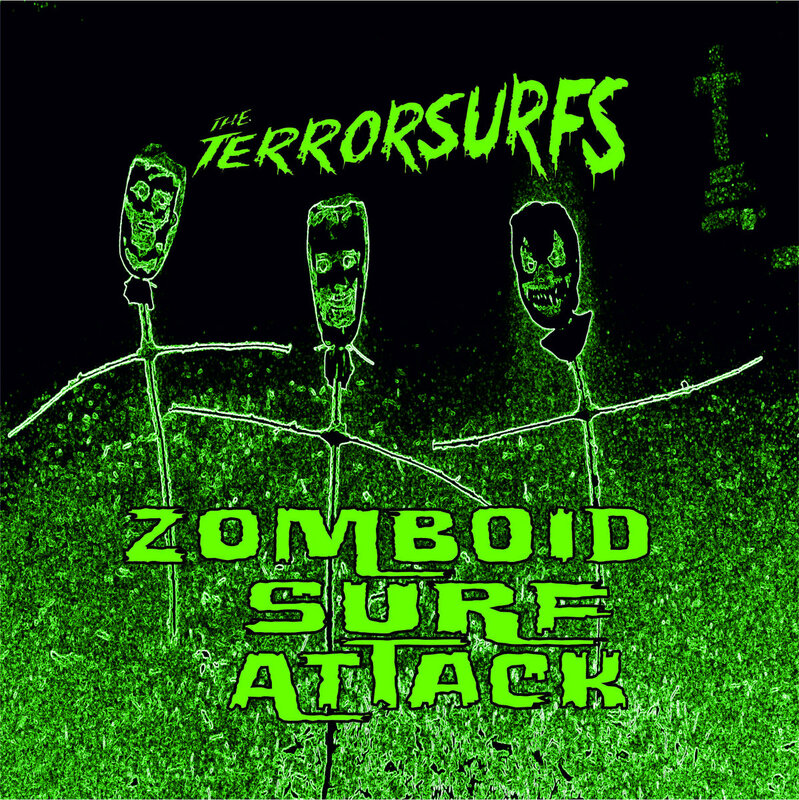 Sharawaji Records is stoked to announce the release of "Zomboid Surf Attack" by The Terrorsurfs (El Guapo, T.T. Shaker and Bamalam) as a digital download and digipack CD. Recorded at The Zoo studio in Hinckley, and tracked and mixed at the Tiki Cave in Nuneaton "Zomboid Surf Attack" introduces the living to mutant zombie powersurf. Witness mutant marvel El Guapo's savage guitar, drum monster T.T Shaker's primordial rhythms and Bamalam's feral bass grooves on 12 ferocious instros that could withstand the impact of a cataclysmic meteorite strike. 12 fierce instros. The twang has never been so fierce - powersurf with killer riffs forged with primeval DNA. The CD is available directly from the band at http://terrorsurfs.com and from Sharawaji Records in addition to the digital download for those zomboids who just can't wait for the postman to deliver this radioactive digipack to your door. The Terrorsurfs official music video for "Horror Face"
The Terrorsurfs and Sharawaji Records are proud to announce the official music video for "Horror Face" as featured on The Terrorsurfs new LP "Zomboid Surf Attack". The full length album including the hits "Surf Bomb / Loco Dinosaurio" will be available from Sharawaji Records as a digital download and digipack CD in late October 2016. Attention Humans! To celebrate the release of The Crushing The Tsunamibots have renamed October to "Bot-tober!" 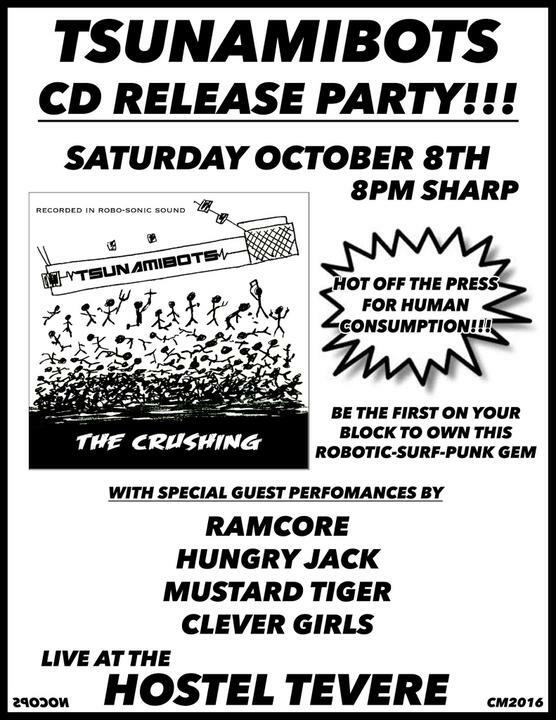 This is the first opportunity to own a piece of Surf Rock history by purchasing "The Crushing" directly from the band on the day of release. This is a busy month for the Robotic Revolution. Attendance to the following gigs is mandatory. You can buy the album and other merchandise directly from www.tsunamibots.com or www.sharawaji.com . The Tsunamibots official music video for "Automaton"